Be able to read and write the chemical and structure formula of important molecules. Be able to recognize common carbon groups found in biological molecules. Describe the properties of water that make it so crucial for biological life. Define pH and identify its importance in living systems. Explain the unique properties of carbon and how these make it central in biological structures. A common terminology for representing atoms and compounds has been developed to help communicate what they are made of and how they are put together. The most important for our purposes are the chemical formula and the structural formula. The chemical formula is a type of shorthand that lists the make up of any compound. The symbols used for the common elements in biological molecules are listed in Table 2.2. A chemical formula contains the symbol for each constituent atom and its ratio in the compound. If more than one atom of the same is type present in a molecule, the number is indicated by a subscript following the symbol, see Table 2.3. The structural formula shows the arrangement of atoms in the compound. Each atom of the molecule is drawn using its symbol and lines are drawn between them indicating the covalent bonds formed. Table 2.3. Comparison of Chemical Formula, Structural Formula, and Molecular Weight. *Molecular weights are never exact integers dues to the existence of isotopes for each element. The atomic weight of each atom is therefore an average of the isotopes commonly found. In biological chemistry, much of the structure of a molecule is made up of carbon and hydrogen atoms. Carbon will form the backbone of the molecule and hydrogen will take up extra bonds not linking to any other atom. Organic chemists have come up with a further shorthand of not writing in the hydrogen atoms and leaving out the carbon symbol. This greatly reduces to the work of drawing structures and increases the structural clarity of the molecule. We will follow this convention throughout most of this book. It is also important to understand the procedure for measuring and weighing atoms and molecules. The weight of an atom is the sum of the protons and neutrons it contains in its nucleus. The molecular weight is the sum of the weights of all the atoms that make up the molecule. Since it is difficult at this time to work with one molecule of anything, the concept of gram molecular weight was created. The gram molecular weight is the weight of 6.022 x 1023 molecules of a compound. For each molecule this works out to exactly the molecular weight of the compound in grams. For example, the molecular weight of water is 18 Daltons (1 oxygen : 16 Daltons; 2 hydrogen: 2 Daltons) and the gram molecular weight is 18 grams. One gram molecular weight of a compound is termed a mole of that compound. Finally, the concentration of a compound dissolved in water is most conveniently expressed as molarity . This is defined as the number of moles of a compound per liter of water. A summary of conversion is shown in Figure 2.6. Figure 2.7. Conversion of grams to moles to molarity.. Sodium Chloride has a molecular weight of 58.44, which is the weight of 6.022 x 1023 molecules. If 58.44 grams are weight out, that would be one mole of NaCl. If this is then dissolved in water it would be a 1 molar solution of NaCl. Water is an excellent solvent. More things dissolve in water than any other solvent. Because of its polar nature, water can cause ionic compounds, like salt, to dissociate into their constituent atoms freeing them to participate in chemical reactions. Enzymes and many of the biomolecules of living systems are soluble in water. Water sticks to things, which results in capillarity, the ability to move through small orifices or fine pores against the force of gravity and other forces. This is crucial for moving water about in plants, animals and microorganisms. Water has a high specific heat, meaning that it requires a large amount of heat to change its temperature. Since organisms are mostly made of water, they loose and gain heat slowly, providing a stable or slowly changing temperature. Because of its polarity, water has a high boiling point allowing life to exist in a large range of temperatures. Where H+ is the concentration of hydrogen ions in moles per liter. In normal aqueous solutions, pH values will range from 0 to 14. A pH of 14 indicates a hydrogen ion concentration of 1 x 10-14 moles per liter. A pH of 0 indicates a hydrogen ion concentration of 1 mole per liter, a very acidic solution! Human body fluids have a pH of about 7, or a neutral pH where the concentration of hydrogen ions equal the concentration of hydroxide ions. Acidic solutions contain more H+ than OH- and have a pH below 7, while basic solutions have more OH- than H+ and have a pH above 7. 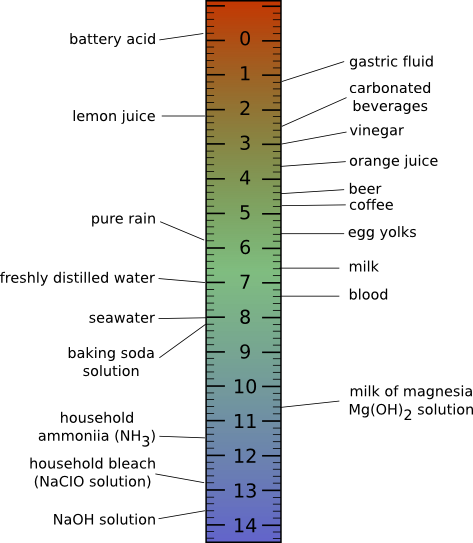 Figure 2.8 shows the pH scale and the pH of some fluids you are probably familiar with. Maintaining the pH of the cytoplasm is critical to cell function. Small changes in pH can have profound effects on the cell. Many enzymatic reactions require the use of H+ or OH- and changing the pH of the cytoplasm can cause them to no longer function. In addition enzyme stability can be affected by pH, causing enzymes to denature. Larger changes can even cause the cells chromosome to destabilize. The cells collection of acids and bases is constantly changing as it moves through its environment, takes up nutrients, carries out metabolism, and excretes waste products. To maintain their internal pH, cells contain many molecules that can serve as buffers, molecular sponges that can soak up H+ or OH-. These molecules readily react with H+ and OH- and prevent drastic changes to the pH of the cytoplasm. Microbes that grow in extreme environments of very high or low pH will even have pumps that pump H+ and/or OH- in or out of the cell. The goal is always to maintain the cytoplasm at a near neutral pH. In low pH environments, H+ is pumped out, while in high pH environments, it is pumped into the cell. In contrast to the cells cytoplasm, the outside environment can have a wide range of pH, and this can dictate what types of microbes can thrive. Soils and water, often near neutral pH, can become acidic or basic depending upon the mix of minerals, pollutants, and the action of microbes themselves. Thiobacillus ferroxidans can grow in high sulfur coal piles, converting the sulfur to sulfuring acid. If coal piles are left out in the open air, water flowing through them can become rivers of sulfuric acid, as low as pH 2. This microbe will happily grow under these conditions. Microbes growing in a laboratory medium, or in milk, can produce acidic end products that drop the pH. This is rarely desirable in the laboratory, and buffers are often added to media to prevent pH changes. However, growth of microbes in milk, and it's acidification, is often desirable in the formation of delectable treats such as yogurt, buttermilk and cheese. No matter the pH of the environment, there are almost always microbes that have adapted to grow under these conditions. Carbon has the ability to rearrange its 1s and 3 p orbitals in its outermost unfilled shell into four equal orbitals that project out in a pyramid-like organization. Each orbital contains one electron, allowing it to form 4 equal bonds, instead of the two that might be predicted if the orbitals were filled as expected. This unique property enables it to bond with other atoms to form intricate lattices of infinite variation. Organic molecules (as carbon containing compounds are called) use carbon backbones as the skeleton for building all sorts of structures that can perform seemingly limitless functions. Life would be very different (or maybe not even possible) if carbon did not behave a bit different than other atoms. Figure 2.9 shows bonding in carbon atoms. Figure 2.9. The arrangement of bonds in a carbon molecule. a) The structure of methane. Note how each bond is equidistant from the others b) A larger carbon molecule, in this case a membrane lipid. c) The structure of of a peptidoglycan molecule. These units will be put together to form part of the bacterial cell wall. As we examine the prokaryotes, certain chemical assemblies involving carbon will pop up over and over. Terms have been developed for these groups and it is useful to learn this jargon to facilitate discussions about how the molecules of life behave and are put together. There are only a few of them, and it is worth spending the time to commit them to memory. These structures have important chemistries in biological molecules that help the larger structures in the cell perform their functions. 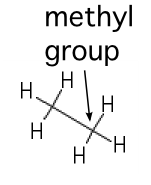 Alcohol or Hydroxyl Hydroxyl groups decorate many different molecules and are important in chemical reactions and in holding larger molecules together. Carboxyl Under normal cell conditions, these groups will often lose there hydrogen. They are acidic and have a negative charge. Amino Nitrogen containing groups. They are found in proteins, DNA and many other structure in the cell. They will often pick up an extra hydrogen from the environment and give their containing molecule a positive charge. alkyl Long chains of carbons tend to repel water and are useful for ordering structures in the cell. In biological systems, stereoisomers are very important, especially in the case of sugars and amino acids. In many cases, organisms and their enzymes will only be able to work with one type of molecule and not the other in much the same way as a glove only fits on one hand. Sugars that have identical molecular formulas, but are mirror images of one another have been given the designations D and L to distinguish them. Biological systems for the most part prefer the D form of sugars. In a similar fashion, amino acids can exist in either the D or L form, but in this case life prefers the L form of amino acids (except for glycine, which does not have stereoisomers) (Figure 2.10). Why was one form chosen over the other? It was most likely a random event of evolution - when proteins were first evolving L amino acids happened to be used to construct them and this bias has been passed down through the ages. There are a few examples of the use of D amino acids for specific functions in living systems, for example as part of the cell wall of bacteria, but for the most part, they are not used. Figure 2.10. The two isomers of alanine.. The L form of alanine is used in proteins, while the D form only finds use in the cell wall of bacteria. We should note that a more modern system has been developed for naming stereoisomers. 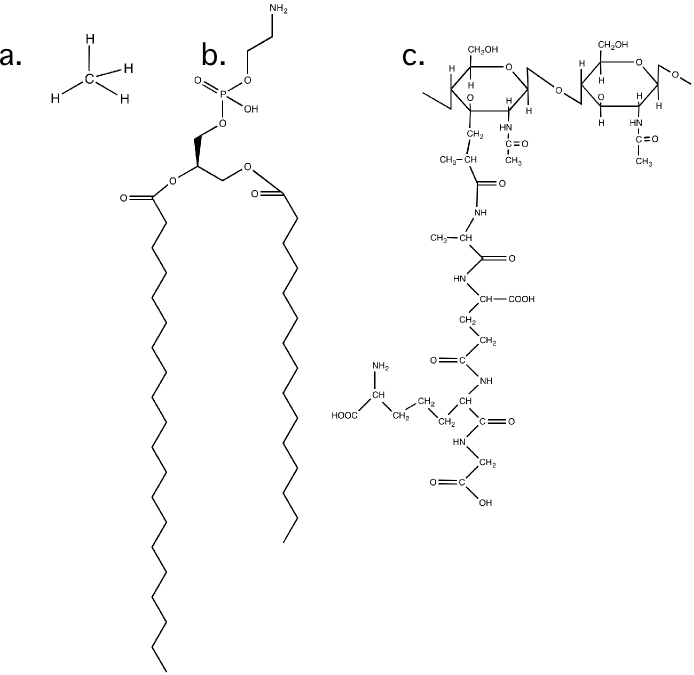 This system happens to use R (rectus) and S (sinister) as designations, but more importantly establishes a consistent method for naming any isomeric compound. The details are not important, but the student will see both D/L and R/S forms when referring to these types of geometries. Unfortunately for historical continuity, the D and L designations are used for amino acids and sugars and complicate things a bit when learning. A chemical formula and a structural formula are two ways to represent molecules. A chemical formula tells you the identity and number of each element, while a structural formula indicates how the elements are arranged in the molecule. Measuring and weighing molecules uses a system based upon the natural mass of atoms. Molecule weights are expressed as their molecular weight, or gram molecular weight. The amounts of molecules are expressed in moles and their concentrations in solutions is expressed as molar. Water is the universal solvent for biological systems. Carbon has the useful ability to rearrange its s and p orbitals, making it capable of forming four bonds instead of two. This allows the chaining together of an infinite number of carbons in unique arrangements, enabling the construction of life. Life has a handedness to it. 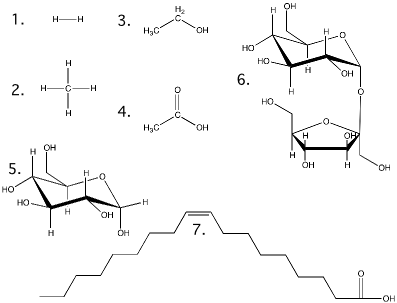 D forms of sugars and L forms of amino acids are mostly used in the construction of biological molecules. 3. What are the properties that make water so useful in biology? 5. Examine a periodic table, can you think of another element that may have the same properties as carbon? Why do you think life forms on earth were based upon C instead of this element?